Concrete ponds are extremely robust and suit many build types. To seal concrete built ponds it is recommended that anti-crack fiber be mixed with final render/plaster coat to prevent future hairline cracks. No water proofer should be added to this final render coat. When this render coat has chemically cured G4 sealant should be applied. G4 sealant should be applied three to four coats thick on same day without allowing sealant to dry between coats. Colour options are G4 clear or G4 black. 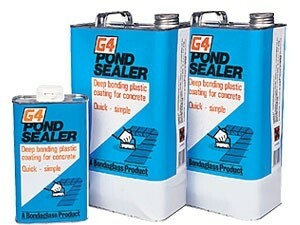 For black G4 use two coats G4 clear followed by two coats G4 black.